different clients’ needs. 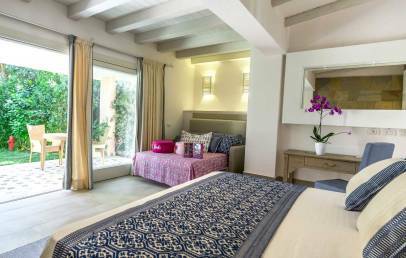 Il Borgo is ideal for active couples as well as for families, located on the slightly raised part of the Resort and close to the Children's Wonderland. Cagliari town is located approx. 45 km from the unique Forte Village Resort, on a bay on the south west coast and dipped in a huge and luxuriant lawn. A nice beach is in front of the resort, a strip of fine sand that wraps the whole perimeter. Nearby thera are several other beaches, like Chia with its laguna, Cala Cipolla rough and wild, Tuerredda where the sea has really tropical colours and a lot more. Il Borgo is a 4* hotel located in the highest part of the Resort, from where guests can conveniently reach the Oasis pool area, the Bike World, the Academy Sport Centre, the tennis courts, the Children's Wonderland and the Piazza Luisa. A bit more farther is also the pool area Baia delle Palme and the Leisurland. The hotel is built on a slope and dipped in a green vegetation, characterized by the intense Mediterranean scents. It enjoys a fantastic panorama view and can be considered as a nice spot of tranquillity. It is recommended to active families and couples as it has comfortable and spacoous accommodations. Inside the resort children can find different activities during the day and night, especially created for satisfying their needs and meet the different needs of the parents. 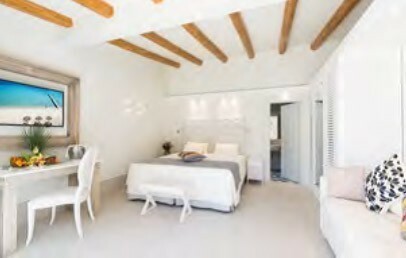 Il Borgo has 31 bungalows furnished in a modern style with air conditioning, LCD TV, Wi-Fi connection, minibar, safety box. Deluxe Bungalow – 31 sq.m., spacious double room with living corner with a sofa bed and patio. On request it is possible to add a child bed. On request and with extra charge, it is possible to have the play package themed child's accommodation of Barbie™. The Acquaforte SPA is considered the most famous Thalassotherapy centre of south Sardinia. Dipped in a wonderful garden of various colours and particular for its mediterranean scents, this centre guarantees to its guests an unforgettable experience of delight and relax. It offers treatments with marine elements (water, sand, algae), 6 pools of marine water with different temperatures, different types of massages, herb teas for all tastes and uses. It can be practiced various sport activities as there are: 12 tennis courts all with artificial lighting, 3 football fields with stands and a regular grass field, 1 modern full equipped gym, various water sports, scuba diving and a 18-holes Golf Club, Is Molas Golf Club, at 8 km away. The guests of Borgo have at their disposal for breakfast and dinner the Restaurant Bellavista, which is located a few steps from the beach and boasts a breathtaking view of the sea. It offers a typical Mediterranean cuisine from the traditional flavors, that is characterized by the attention to the details; the service is buffet both for breakfast and dinner. Further restaurants open for dinner, not included in the half board, available with a supplement (table reservation required) are: Belvedere, Cavalieri, Le Dune, Forte Gourmet, Terrazza San Domenico, Hell’s Kitchen. The Forte Village Resort has 10 swimming pools, 2 of them are for children, located in different sides of the resort area. For the shopping lovers the Resort offers a variety of boutiques where are to find all the prestigious griffes of the Italian fashion. These are all concentrated in the promenade alongside the Piazza Maria Luigia, where you can also find the chauffeur, the kiosk and the jewellery. In the evening the square becomes a meeting place, where take place different entertainments that fit for adults as for children. City tax – The City of Pula requires the payment of Euro 1,50 per person/overnight to be paid on spot. Children under 12 years, disabled people and their assistants, business travellers and students are exempted. Spacious double room with elegant and modern décor with a living corner with sofa bed. The room offers comfort and on request it can be added a bed for a child. The bathroom has separate tub and shower (most of the rooms). A private patio in the lush garden of the resort is at guests disposal. On request and with a supplement it is possible to have a themed child's accommodation package of Barbie™. COMBO 6 – Special Offer for Families! 10% reduction + max. 2 children up to 12 years old free of charge in the room with their parents. Bookings confirmed within April 30th 2019 (stays until July 6th). COMBO 6 – Special Offer for Families! 10% reduction + max. 2 children up to 12 years old free of charge in the room with their parents. Bookings confirmed within April 30th 2019 (stays from August 24th to October 7th). COMBO 5 – Special Offer for Families! Max. 2 children up to 12 years old free of charge in the room with their parents. Bookings confirmed within April 30th 2019 (stays from August 17th to 23rd).